a bit lifeless, weakish music, but I like the 3d-graf style, even though it seems to be the next thing 'in' right now (see f.e. orange comes).. I really love the 3D graffiti text, but on the whole it's rather boring. Everything just sorta sits still and doesn't go anywhere. 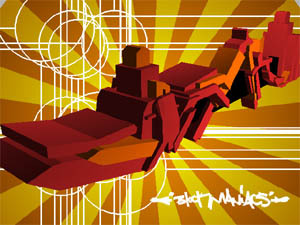 uhoh... i like the 3d graffiti too... trying to make 'em myself as well. as said, there could have been a bit more variation (yep... I read the info file...), but still all my respect to the nice graffitis. Like everyone, 3d grafs rock. The music is cool. Ugly, boring, a terrible color scheme. very professionally produced music and nice 3d graffiti idea, but it looks somewhat empty and unfinished. Superb designed, minimalistic, GRAFFITI demo!! it wasnt perfect but still so good! It does look good with AA enabled, but that radial blur is possibly the uglies i have ever seen. 3d grafitti rules. I wish there was some more yo stuff though.. Too much ganja and not enough gold chains, guns and hoes. I think it's really great to see graffiti with 3d! one word: wow. the music was the best demosoundtrack i've heard since... can't even remember!, the graff... lovely. i can't believe i saw this prod 3 years late :) thumbs up! rulez added on the 2005-02-08 16:39:43 by AbcuG! much better than your 64k intro. I didn't thumb this up yet? bad mistake, cause I really loved this one from the first minute that I saw it at dialogos. Grafity! I like this one. page created in 0.020432 seconds with 15 queries.